It can be a challenge to keep the pH and chlorine levels of your pool in constant balance, rather than cycling up and down. The IntelliChem® chemical controller does it automatically by monitoring your pool's pH and sanitizer levels, and delivering just the right amount of chemicals. IntelliChem uses the same technology found in commercial installations, water parks, hotel and community pools. 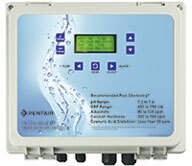 It can work independently, or together with Pentair automation products - so you can check your water chemistry at at glance.